“In the twenty-first century, principled behavior is the surest path to success and significance in business and in life,” writes Dov Seidman, CEO of LRN, in the preface of his book, “How: Why How We Do Anything Means Everything.” Seidman calls on individuals and organizations alike to focus on values, character, and trust, arguing that in today’s world, it’s not only the right thing to do, it’s good business. We had a chance to sit down with Seidman after he spoke to a gathering of executives at Workday Rising last month to learn why how we do things has become more important than what we do. In your work, you argue that the ways in which people have worked no longer, well, works. Why is this? The world is not just rapidly changing, it’s being dramatically reshaped. We’ve gone from being connected, to interconnected, to globally interdependent. Technology is now bringing strangers into intimate proximity at an accelerated pace, affording us richer experiences but also demanding new levels of empathy and understanding. These same technologies are granting us MRI vision into the innermost workings of traditionally opaque organizations and even into the mindsets and attitudes of their leaders. Further, the ability to differentiate purely on the product or service you deliver has eroded. There are competitors who can copy what you’ve done, and do it quickly, cheaply, and effectively. The source of competitive advantage has shifted to behavior. Competitors can copy what you do, but they can’t copy how you do it. You talk about trust as being fundamental. Why is that? Trust is a catalyst that enhances performance, binds people together, and shapes the way they relate to each other. Without trust, it’s irrational to take risks. If you think somebody is going to take credit for your ideas or ridicule a slightly crazy notion, you won’t put yourself out there. And without new ideas, innovation and progress can’t happen. Trust also allows us to function in times of uncertainty. Progress can now be measured today by the degree to which employees and stakeholders embrace vulnerability and extend trust to each other. Yet at the exact moment, there is a greater appreciation for the positive impacts of trust in organizations, we face widespread lack of certainty in a fake-news, post-truth world. I call this problem the Certainty Gap—the distance between an individual’s ideal vision of stability and security, and the realities of life. Filling the Certainty Gap requires business leaders to fundamentally rethink the meaning of trust and do something that may strike some as counterintuitive: give trust away. We can’t make the world more certain, but by extending trust, as opposed to requiring others to earn that trust, business leaders can help fill the Certainty Gap. That starts with trusting people with the truth. 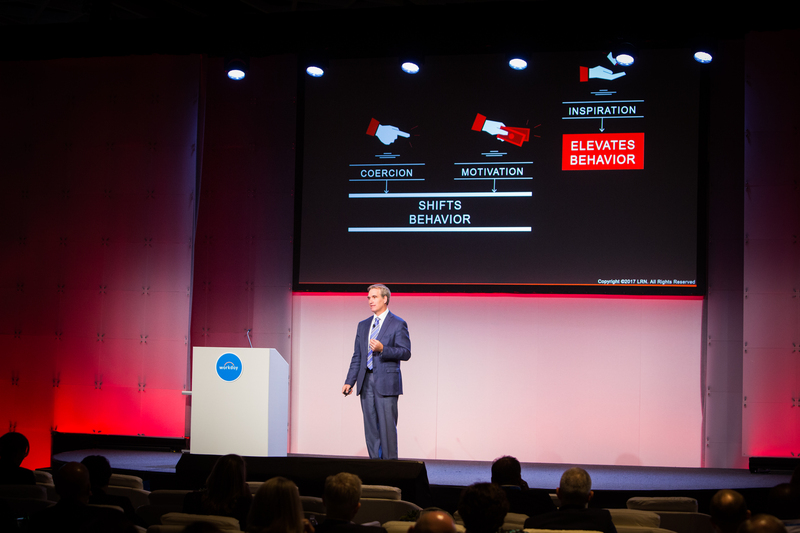 “The way to get to elevated behavior is through inspiration, and through aligning people’s own personal values with company values,” said Dov Seidman at Workday Rising. What advice would you give individuals who want to focus more on their “hows”? One of the simplest and most powerful tools we have is the ability to pause. Pausing creates a space where one can see clearly, differentiate amongst the competing stimuli of daily life, and make determinations about how to best move forward. I call it pausing in stride, and then moving through the four “Rs”: Reflect on the situation and the world we’re living in. Reconnect to your character; the aspiration, mission, and purpose. Rethink assumptions about what the next right thing is. And then reimagine a better path forward. Pausing is something we can uniquely do as humans, and it gives us the opportunity to do the next right thing, not just do the next thing right. In your book you talk a lot about the importance of values and culture for organizations. Why is this important? Companies have character, and their character—how they do what they do, how they keep promises, how they make decisions, how things really happen inside, how they connect and collaborate, how they engender trust, how they relate to their customers, the environment, and the communities in which they operate—is their culture, and it is a window into their values and what they value. You recommend organizations rethink how they operate, and move towards more self-governance. What exactly does this mean? Companies have used carrots and sticks to motivate or coerce behavior. That doesn’t work anymore. I asked the audience at Workday Rising what types of attitudes or behaviors they’d like to see more of from their workforce. The answers were things like trust, respect, empathy, integrity, compassion, and honor—not specific skills. You can’t coerce people to adopt these behaviors, and you don’t have enough carrots to make them happen. They must be inspired. Self-governing organizations replace push and motivation, which come from outside, with inspiration, which comes from within. By aligning an individual’s sense of purpose, mission, and values with those of the organization, you unleash people to do the next right thing.